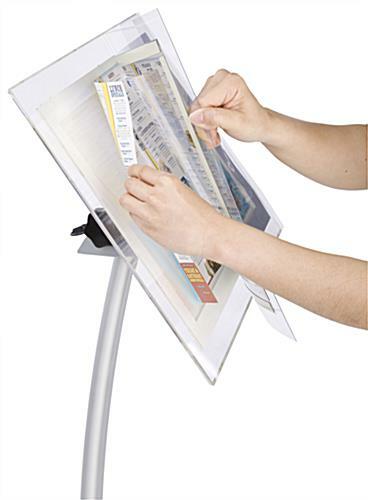 Menu stand frame mounts in landscape or portrait orientation to hold different format menus. 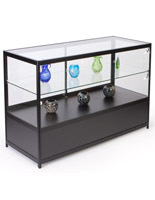 Acrylic frame is adjustable for an easy viewing angle. LED lighting illuminates 17" x 11" signage and the edges of the acrylic surface. 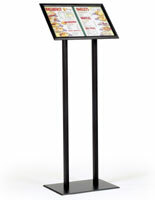 Steel base with a 14-1/8" diameter stabilizes the menu stand. 3/16" Acrylic plate, silver base & curved pole has an upscale style. 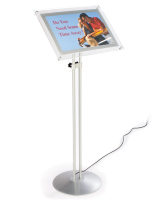 This menu stand with a light up surface is a significant improvement on the traditional floor-standing sign holder! LED lighting illuminates the acrylic signage area of this unit. 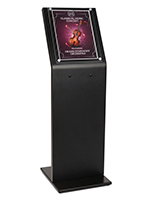 An illuminating menu stand, such as this food display, is more effective at capturing patron's attention and luring them into a store or restaurant. 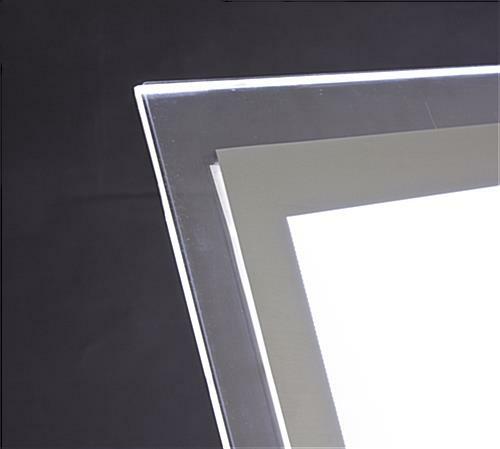 The LED lighting illuminates the beveled edges of the acrylic display plate as well! This menu stand that tilts, also known as a sign holder, is more captivating than similar displays, due to the edge lit effect created by the lighting on the beveled acrylic plate. The frame is 3/8" thick and creates a 1-1/4" wide border surrounding the signage area. The illuminated sign surface of this menu stand features a light dispersion pattern that ensures posters are illuminated evenly, and do not have any shadows or "hot & cold" spots. 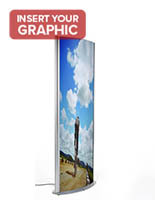 A flexible plastic lens secures graphics in place via magnetic strips. As an added bonus feature, the sign frame tilts, allowing users to position information at an angle that is easiest for customers to read. 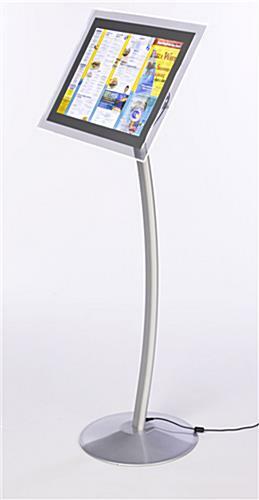 The sign holder, LED menu stand features a metal base and pole with a silver finish. For stability, the steel base has a diameter of 14-1/8". 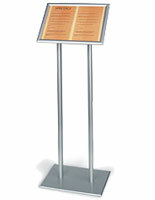 The menu stand has a curved post made from aluminum, and the base has a steel construction. The power cord is 60" long, which allows this unit to be placed several feet from the nearest power outlet. 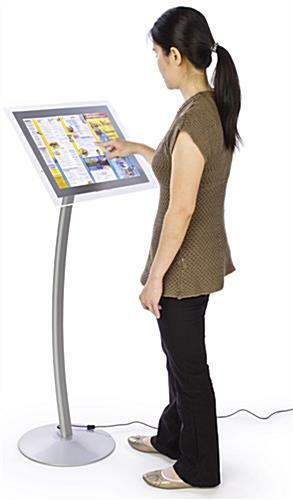 The menu stand that is affordable has the upscale style needed to post menus outside of fine restaurants. As an added bonus, each of the electrical components is UL listed. 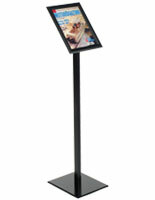 The freestanding menu stand design and light weight of this display makes it easy to relocate as often as needed. 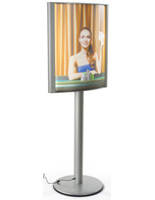 The illuminated surface, durable construction and modern style of this unit creates a sign frame ideal for displaying menus. 15.4" x 50.0" x 19.0"